An annulment is when the Court declares that your marriage was never valid – meaning you were never really married. Some marriages are considered void – meaning that the State would never recognize the marriages – and some are voidable – meaning that the State would recognize the marriage under certain circumstances but that the marriage may still be annulled. Annulments are not divorces and are difficult cases for attorneys who typically only handle divorces. Unlike divorces, annulments have specific requirements that must be met in order to qualify for an annulment. Additionally, the evidentiary burdens are different on many annulment cases. 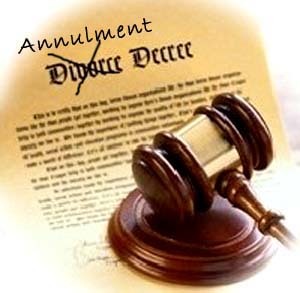 In order to understand if you qualify for an annulment you should speak with an attorney familiar with annulments. In order to see if an annulment is right for you, please review the following factors the courts often look to when reviewing an annulment. Marriages performed to persons who are related. Grounds for declaring a contract void in a court of equity (there was mistake, duress, undue influence, unconscionability, misrepresentation, or frustration of purpose involving the marriage. This typically includes failure to consummate of the marriage, severe pressure, and inability to have children). The Law Offices Of Patrick Driscoll, LLC has completed countless number of annulments cases successfully. If you believe you are entitled to an annulment, you should contact us so we can review your specific situation and see if you may be entitled to an annulment.